The California High Speed Rail Authority and Caltrain pledged in a recent project update to "Incorporate Context Sensitive Design Principles into project planning and outreach," apparently at the urging of the Peninsula Cities Consortium, a group representing several peninsula cities in matters pertaining to high speed rail. As described in a City of Palo Alto press release, the cities hope that the Authority and Caltrain will apply an approach to decision making and design known as Context Sensitive Solutions. Context sensitive solutions (CSS) is a collaborative, interdisciplinary approach that involves all stakeholders in providing a transportation facility that fits its setting. It is an approach that leads to preserving and enhancing scenic, aesthetic, historic, community, and environmental resources, while improving or maintaining safety, mobility, and infrastructure conditions. The push for CSS is rooted in a legitimate concern from peninsula communities that the rail corridor will be built up without sufficient regard for its community context. Kumbaya or the Real Deal? The CHSRA/Caltrain bulletin uses the words Context Sensitive Design Principles, stopping short of using the Solutions keyword. Semantics? Perhaps, but if the CSS process were being applied to the peninsula HSR project, many community design workshops would already have taken place. It's getting a little late for that, with the CHSRA preparing to reveal the results of months of design work performed entirely out of the public eye by Parsons Brinckerhoff and HNTB--and then only because NEPA and CEQA laws require all the design alternatives to be fully and publicly documented. While the Authority has collected a large amount of community input through its environmental scoping process, all the exchange has so far gone only one way: into the black box. "Thank you for your comment card." Key design decisions tend to made early, based on top-level requirements specifications and drawings. A list of these appeared in the CHSRA's July 2009 Program Summary Report, starting on page 54. These documents are very important because they establish the framework under which all design work is proceeding. When that work is made public, questioning a design will be ineffective unless we know what the requirements are that produced it. CSS principles call for design collaboration and concensus building, early and often. Under CSS, the public would have open access to all the requirement specifications and directive drawings that drive the design. At numerous public meetings, however, the CHSRA and its engineering consultants have deferred, side-stepped or dismissed any specific design questions with a cursory "we don't know that yet." They may be concerned about showing bias, compromising the environmental review process, or inflaming community passions, but such coyness is definitely not among the qualities of Context Sensitive Design. CSS is most commonly applied to highway projects, where context-sensitivity can mean more than a few ornamental embellishments: sometimes, it's about slowing down traffic to make a road mesh consistently with the neighborhood. Applying that model to HSR, CSS can become a blank slate onto which community stakeholders may project their desire for fewer trains, tunnels, or slower speeds. The CHSRA, meanwhile, intends to implement a service plan based on ridership studies and assumptions about service speed and frequency, painstakingly developed over the last several years. The plan calls for traffic of over 200 weekday trains running between San Jose and San Francisco in as little as 30 minutes, by the year 2030. The need for grade separations, the number of tracks, and the speed of the trains are all direct consequences of this plan, and the Authority's battle lines will be drawn around it. 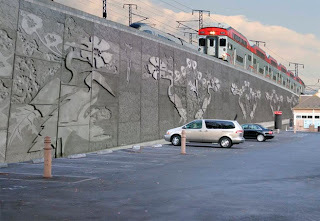 From their point of view, "Context Sensitive Design" might mean ornamental retaining walls (as shown above with a spoof on a famous visualization circulated by HSR opponents), fancy overhead electrification supports, or anything else that doesn't compromise the plan. Without compromising the plan, the traffic-calming angle is an interesting one. Slowing down the trains through residential neighborhoods is an idea worth studying; the time penalty from slowing to 100 mph from 125 mph for a stretch of about 5 miles (40 seconds) is roughly equivalent to the time gained from straightening out a single curve in San Bruno. Of course, this raises some questions of environmental justice: why should some folks in San Bruno lose their homes so other folks in Atherton or Palo Alto can enjoy lessened noise and vibration? When it comes to CSS, actions will speak louder than words. the available options for procuring affordable, off-the-shelf train designs. 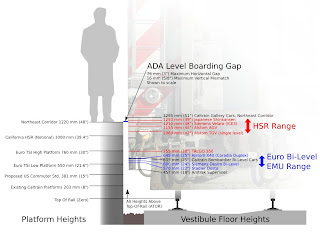 The Americans with Disabilities Act (ADA) mandates that all new rail vehicles and platforms provide level boarding, with the height of the train floor within 5/8" (16 mm) of the height of the platform, a tight specification that is quite difficult to achieve in everyday practice. The grand staircase that greets most Caltrain passengers will no longer be allowed because the ADA requires "the most integrated setting reasonably achievable." Caltrain got by until now by using a hodge-podge of grandfather clauses and band-aid solutions allowed under ADA law, but as the system transforms from an old-style diesel commuter railroad to a modern, fast and frequent transit system, level boarding and full accessibility is no longer a negotiable feature. Indeed, level boarding features prominently among the goals of Project 2025, Caltrain's blueprint for reinventing the peninsula commute. That does leave the question unanswered: exactly which height is appropriate for this level boarding to take place? As we will see, this question has far-reaching implications for the peninsula corridor. Caltrain has for many years harbored the desire, if not the financial means, to operate swift electric multiple unit (EMU) trains. These trains would increase service speed and frequency, especially at those stations that saw service cut back to make room for Baby Bullet service. Going back many years, Caltrain's studies invariably conclude that such EMUs should necessarily have two levels (an upstairs and a downstairs), much like Caltrain's existing fleet. The reasons have to do with providing a certain passenger capacity under a cost trade-off between service frequency and train capacity, fitting within platform and train length limitations, taking full advantage of the ample vertical clearances that are available... and last but not least, perhaps also the sheer Strength Of An Idea. For reasons related to vehicle packaging (fitting all the train's innards, systems and amenities around the passenger space), as well as historical European platform standards, these double-deck EMUs typically have entry doors and vestibules on the lower deck, with a floor height of 570 - 645 mm (22" to 25"). High-platform EMU designs are less common, although they do exist in Paris and Sydney. While HSR on the peninsula corridor has long been a dream, the increasing tempo of events (Proposition 1A, the federal stimulus, environmental planning for the San Francisco - San Jose HST project) has made it increasingly likely that Caltrain commuter trains will mingle on the peninsula corridor with a steady flow of long-distance high speed trains linking the region to the rest of California. Caltrain and the California High Speed Rail Authority (CHSRA) have signed a memorandum of understanding establishing a broad framework for sharing the peninsula corridor, which envisions "mixed traffic from Caltrain commuter rail and the high speed train service capable of operation on all tracks." The MOU identifies the urgent need for a systems engineering integration plan, a detailed technical framework for how Caltrain and HSR will mesh together. Importantly, this plan will have to address the issue of level boarding, and whether "mixed traffic" also applies to platform tracks. HSR will quite naturally gravitate towards high platforms. Commuter platforms may not exceed 8" above top-of-rail (CPUC General Order 26) to provide clearance for freight trains. These regulations not only contradict each other, but also lead to the strange notion that HSR and commuter rail are inherently incompatible and must therefore be built to differing platform heights. Regardless of this legal mish-mash, it is unlikely that the CHSRA will choose a platform height with Caltrain compatibility in mind; they will choose whatever suits the high speed rail system. That leaves Caltrain to follow their example... or not. One can easily see where this is all headed, based on the figure at left: with bi-level EMUs, Caltrain is likely to end up with an entry floor height in the low twenty inches, while HSR will end up in the forties. The non-negotiable requirement for level boarding would result in two different and incompatible platform heights. Does that even make sense? If one considers the peninsula corridor as a transportation system rather than two independent services simply sharing a right of way, platform compatibility emerges as a key enabler for realizing the potential synergy between HSR and Caltrain, with one serving as a feeder for the other. HSR can operate as a Flight-Level Zero airline with enormous parking garages and rental car facilities, or it can be deeply integrated into an efficient network of transportation where riding the train to your destination anywhere on the peninsula corridor is not only possible, but convenient and desirable. One of the greatest opportunities currently facing rail planners is the provision of cross-platform transfers between Caltrain local and express trains. Under this operational concept, a local and an express show up simultaneously, on opposite sides of the same platform, and exchange passengers. In effect, the express overtakes the slower local at the platform, rather than somewhere between stations, allowing passengers to switch conveniently from one to the other. Such exchanges, operating on regular clock face schedules, would enable fast and frequent service to and from all the stations currently under-served by Caltrain, such as Belmont, Burlingame or San Antonio, and would greatly magnify the utility and efficiency of Caltrain as a feeder to peninsula HSR stops. 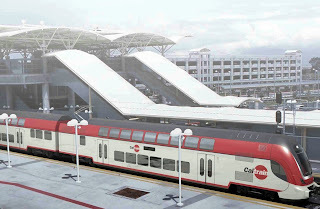 Caltrain to Caltrain cross-platform transfers, the key to this highly desirable operational concept, inherently require the same boarding height on both sides of the platform as shown in the figure at right. A cross-platform coordinated transfer between local and express commuter trains would be precluded at peninsula HSR stops, unless additional platforms were built. As shown in the figure under Option B, the two key transfer points on the peninsula corridor (Millbrae and Palo Alto / Redwood City) would preclude cross-platform transfers precisely where they are most needed, permanently crippling Caltrain's development potential. If cross-platform Caltrain transfers were nevertheless implemented at the Millbrae and Palo Alto HSR stops, these large stations would have to be further expanded with additional platforms (shown in the figure under Option C) and up to six tracks (if HSR infrastructure were completely secured). Such enormous stations, approaching the size of an aircraft carrier, would be out of scale with the surrounding community. San Francisco's Transbay Transit Center would be operated as two independent mini-terminals, with four HSR platform tracks and two Caltrain platform tracks. The loss of redundancy from the inability to assign any train to any platform would (a) exacerbate traffic jams in the station approach (by limiting the available paths and thus curtailing terminal capacity); (b) allow small incidents that delay a train (e.g. a medical emergency or law enforcement activity) to propagate to other trains; and (c) prevent spare capacity (unused platform tracks) from being re-allocated between Caltrain and HSR in response to actual travel demand, as opposed to ridership projections made decades into the future. The resulting inability of the Transbay Transit Center to support a full Caltrain rush-hour schedule would require the existing station at 4th & King streets to be retained indefinitely, thus confusing commuters, contradicting San Francisco's 1999 Proposition H, and occupying many acres of land that would be more usefully developed for other purposes. The San Jose train station, already planned as a massive double-deck structure, would require dedicated tracks and platforms for each service. With compatible platforms, it is likely that a single-deck configuration could meet the various needs of Caltrain, HSR, ACE and Amtrak. Under delayed or otherwise unusual traffic conditions, high speed trains could not stop at a Caltrain platform to discharge passengers. If a common, compatible platform height specification for both Caltrain and HSR is the desired outcome, how do we get from here to there? One of the key requirements for the development of the peninsula rail corridor is to do so without interrupting Caltrain service, to avoid dumping another 20,000 cars on congested roads. Furthermore, changing the height of station platforms, or procuring and commissioning new trains, are not done at the flip of a switch: each would last many months. Under those conditions, converting Caltrain to a different boarding height will be tantamount to changing the wing of an airplane... while in flight. That's not to say it is impossible, but it will require some very creative solutions from Caltrain, an issue that we will revisit later. In the meantime, now would be a fine time for Caltrain to initiate the waiver process for GO-26D, since it is sure to encounter stiff opposition and delay from certain entrenched interests. Only 2.7 miles of the peninsula rail corridor fall within the city limits of Brisbane (population 3597), of which the majority was widened to four tracks in the early 2000s to enable overtaking for Caltrain's Baby Bullet express service. The four tracks already in place might at first suggest that the impact of high speed rail on Brisbane would be relatively minor, especially since Brisbane does not have a single grade crossing and will therefore not require any controversial grade separations. Unfortunately for Brisbane, HSR is likely to be much more than just tracks passing through town. 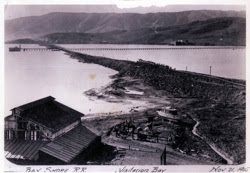 The existing alignment of the Caltrain tracks was established by the Southern Pacific railroad's Bayshore Cutoff, a series of trestles and tunnels built at the turn of the 20th century to provide direct rail access to San Francisco (shown under construction in the 1905 photo at right, looking south). The marshes between the tracks and the original shoreline were filled in with rubble from the 1906 earthquake, and became known as the Baylands (see overview map, as well as track maps for mileposts 5 and 6). In its heyday, this area served as a massive railroad yard, complete with engine roundhouse. The tracks were shut down in 1982, and all that remains of the yard is a vast expanse of soil contaminated with lead and oil, forming the western portion of the 650-acre site now known as the Brisbane Baylands. The cleanup and restoration of the Brisbane Baylands is to be followed by redevelopment, by a city eager to grow its tax base. The Brisbane Baylands Community Advisory Group maintains a nice library of documents relating to the site, including a 2008 overview of the planned development. The Brisbane Baylands project is well into its CEQA environmental review process, and all the alternatives that have been defined for detailed study in the EIR involve a nearly total redevelopment of the former railroad yard. Most of the stakeholders in this process seem oblivious to the possible implications of the high speed rail project for Brisbane. The HSR scoping comments submitted by the City of Brisbane never even mention two very important words: maintenance facility. The high speed rail system requires train maintenance and storage facilities in the vicinity of its major terminals. This topic came to light during the California High Speed Rail Authority's August 2009 meeting, when the board chairman noted that the requirements for such HSR maintenance facilities were not generally understood by the public, and asked for memoranda describing these facilities to be released. Including other items such as parking and access roads described in technical memorandum 5.3, the overall size of the San Francisco facility balloons to 90 to 108 acres. The conceptual plans for this facility are found in the technical memorandum 5.1 directive drawings. 90 to 108 acres is a lot of land, a strip over 1000 ft wide by nearly a mile long. The CHSRA additionally desires the access tracks to such facility to be about 4000 ft long, to allow trains to leave the main corridor at about 100 mph and enter the maintenance facility without forcing other trains to slow down. This concept is similar to a freeway exit ramp, and would likely be grade-separated from the main line through a suitable arrangement of flyovers. The total length of the facility would be over two miles. 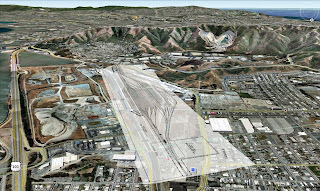 Ideally, again according to the CHSRA memoranda, the facility should be located preferably within 1.5 miles of the San Francisco terminal, desirably within 3 miles, and exceptionally further than 3 miles. The good news for Brisbane is that it is further than 6 miles from the Transbay Transit Center in San Francisco, seemingly outside the acceptable range of this criterion. The bad news is that there are no 100-acre parcels of flat, open land available within those 6 miles. Curiously enough, a February 2009 visit to the Brisbane Chamber of Commerce by the CHSRA's Quentin Kopp does not seem to have touched upon all the implications of high speed rail for Brisbane, since it was reported as having been "well received." Let's see how it goes after Brisbane wakes up-- see the realistically-scaled overlay of the CHSRA's yard plan shown above, or better yet, see for yourself in Google Earth. NOTE: This post will be updated continuously, as warranted by additional information or new events relating to Brisbane. [Update 9/10] The city of San Bruno has now coughed up $350k to grease the rails for this project. [Original Post] There are new signs that Caltrain's San Bruno grade separation project is now on the fast track to construction. The project appeared in the MTC's recent Peninsula Corridor Investment Strategy as a top candidate for a slice of federal high speed rail stimulus funding, and is now also slated to receive $30 million in Proposition 1B state funding. 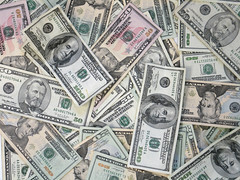 Like the stimulus money, this new source of construction funds comes with strings attached: Caltrain and the city of San Bruno must award the construction contract by July 2010, effectively in the blink of an eye for such a big construction project. A recent presentation to the San Bruno city council reveals that the project is the same old design that Caltrain engineered with BkF nearly a decade ago, a design that wasn't half bad for commuter rail. That was then; with high speed rail in the mix, the requirements have now changed--but the design (since taken over by HNTB) has not. As proposed, the San Bruno grade separation is fundamentally ill-suited to high speed rail and mixed corridor operations. Evidently, nobody sees anything wrong with this. The proposition, in this case, is that the San Bruno grade separation project is a poorly conceived design that will significantly set back HSR and Caltrain service, and is therefore a tragic waste of taxpayer money. Because of the millions of dollars involved, this proposition is likely to fall on deaf ears in our local transportation industrial complex. In the headlong rush to shovel readiness, key shortcomings are being ignored. The San Bruno grade separation fails to straighten the worst curve on the entire peninsula corridor. This is low-hanging fruit, which if not picked will cripple high speed rail trip times for generations to come. If there is only one place on the entire peninsula corridor where a small amount of eminent domain taking makes sense, this is it. The San Bruno grade separation is designed with outside platforms, which means that Caltrain is essentially shooting itself in the foot with regard to operational flexibility. As far as commuter service concerned, an island platform would be far superior when HSR is added to the corridor. The San Bruno grade separation is being built in two phases, first as a commuter-only two-track station, with later demolition required to build the second pair of tracks for HSR. That's doing it twice, rather than doing it right. $30 million (a small portion of which is featured in the opening photo by Tracy O) may sound like a lot, especially to a cash-starved public transit agency, but in the context of rebuilding the peninsula corridor for mixed Caltrain / HSR operations, it is but a drop in the bucket. The overall budget for the peninsula is well over $5,000 million, or nearly 200 times as much. Caltrain's outdated vision for San Bruno is not worth compromising the key corridor design decisions (curve speeds, express track configuration, station layout) that must be carefully weighed against the respective needs of Caltrain commuter service and long-distance high speed rail service. Unless the key design decisions that impact service are not being weighed at all? Caltrain, San Bruno and the CHSRA should slow down, take a deep breath, and DO IT RIGHT, even if that means turning down some funding. San Bruno can wait a few years, now that its dangerous rail crossings have received interim safety improvements.